Getting a domain name involves registering the name you want with an organisation called ICANN through one of many available domain name registrars. If for example, you wanted to register “igorware.com”, you couldn’t do it because I already registered it (:p)… as I was saying, if you wanted to register a domain with your brand name, you would have to find a registrar and pay a fee to get your domain. Cost is usually from about 10$ to about 120$ for one year, but note that some TLDs require you to register for minimum two or five years. The gTLDs (generic top-level domains) are global extensions, they have worldwide recognition. Generic TLDs like .com and .net have been in use for a long time now and you might have problems finding a free domain name to register with them. ICANN recently introduced about 500 new generic domains where you will have less issues finding a free domain name, but it could cost you a lot more (for example .com is $10, .travel is $100). With these new TLDs (for example “company.travel”), while they are cool, you might have some issues with them. People are not very used to these new TLDs so possibly they would not recognize it’s a link to some website, same happens when shared via instant messengers or social networks. This will only get better, but it is something to have in mind. The ccTLDs (country code top-level domains) are country- or region-specific extensions. They’re great for connecting with customers in specific locations. Examples include .de (Germany) and .eu (the European Union). If you are targeting only users in specific country I definitely recommend using country specific TLD, it will help with users identifying for whom is the website for and also search engines will most likely give you a boost for searches coming from that country. Most hosting companies offer domain registrations as well as hosting (and vice versa) so if you already have a hosting account, the quickest and easiest is to just register domain with them. It’s quick and easy because it doesn’t require you to have any technical knowledge, everything is automatically setup for you as soon as you register your domain. 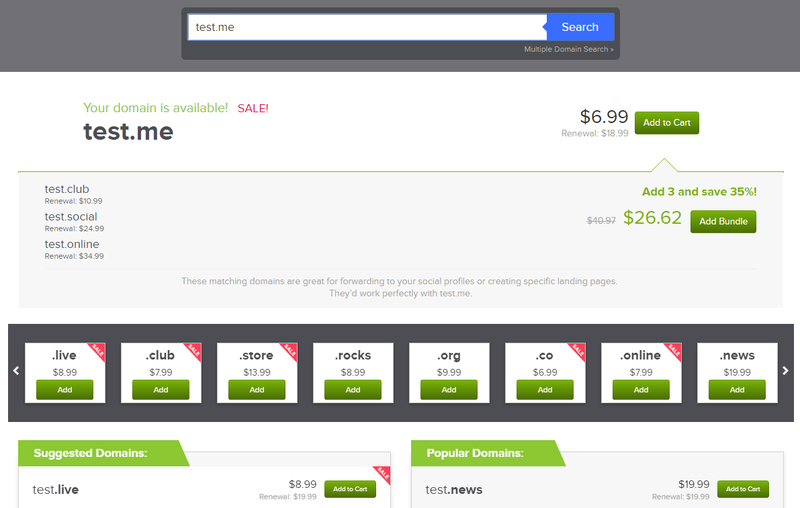 Some even offer one “free” domain along with your hosting plan. This method is usually not recommended due to prices, technical abilities, and biggest possible problem if you use some dodgy hosting company which might register themselves as the owner of your domain and later try to extort money from you to give you that domain back. I haven’t heard about this kind of cases for years, but you should always be careful and check user experiences on the internet about hosting and domain registrant companies. name.com – This is the company I use and I’m giving you a referral link here, which will get you a one time 5$ if you register. I’m satisfied with their service, admin interface, prices are competitive, all is good. I can’t say anything about their support because I never needed it so far. 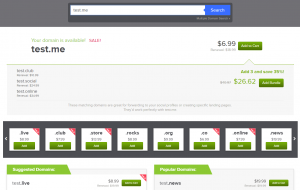 namecheap.com – Another registrar which is very popular. Similar prices as name.com. domains.google – Did you know that Google also provides domain registration services? Yup. If you really like Google go for it, but I should warn you that their prices are a bit higher than with other registrants and I don’t think there is any good reason for that. Note that some domains (especially ccTLDs) can be registered only with certain registrars or they require that your place of residence is in certain country. I already mentioned one scam where you pay the hosting company to register domain for you but they put themselves as the owners of the domain. They are registered owner of the domain so you don’t have any proof that the domain is yours, later on they might try to extort money from you to get it back. I will write another blog post about possible scams because it would be too much information for this blog post. Most registrars provide various promotions through out the year so it pays off to subscribe to their newsletters.